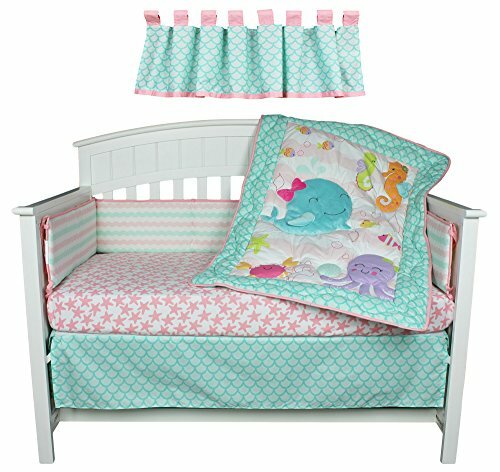 The Sea Sweeties 5 Piece Crib Bedding includes a quilt, 4 sided bumper, dust ruffle, valance and 1 fitted sheet. Quilt is 65% poyester/35% cotton, fitted crib sheet 100% cotton, crib skirt 65% polyester/35% cotton, valance poly/cotton. Machine was cold in gentle cycle. Do not bleach, tumble dry low and iron on lowest setting. If you have any questions about this product by Belle, contact us by completing and submitting the form below. If you are looking for a specif part number, please include it with your message.